I am a huge fan of roasted butternut squash soup. It is so simple to make, and so versatile. 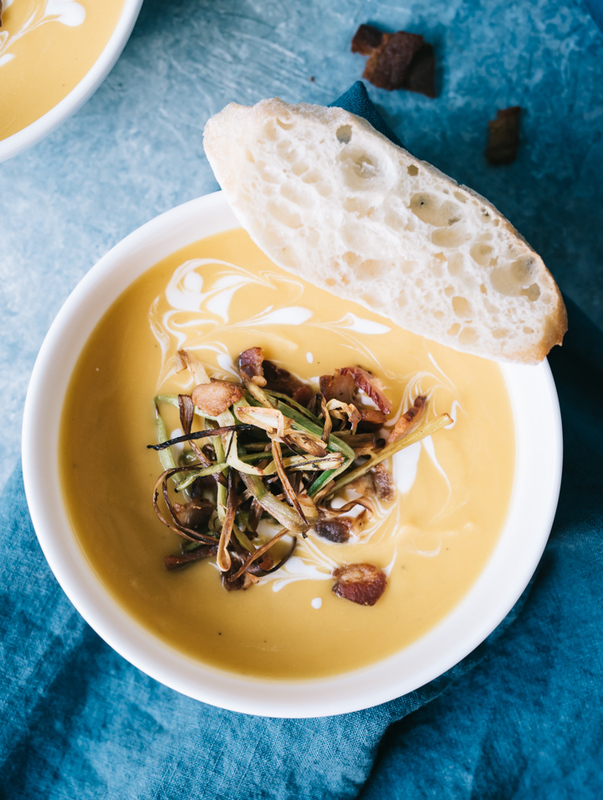 This version of roasted butternut squash soup is made with bacon and crispy leeks and makes for a perfect light lunch or dinner. 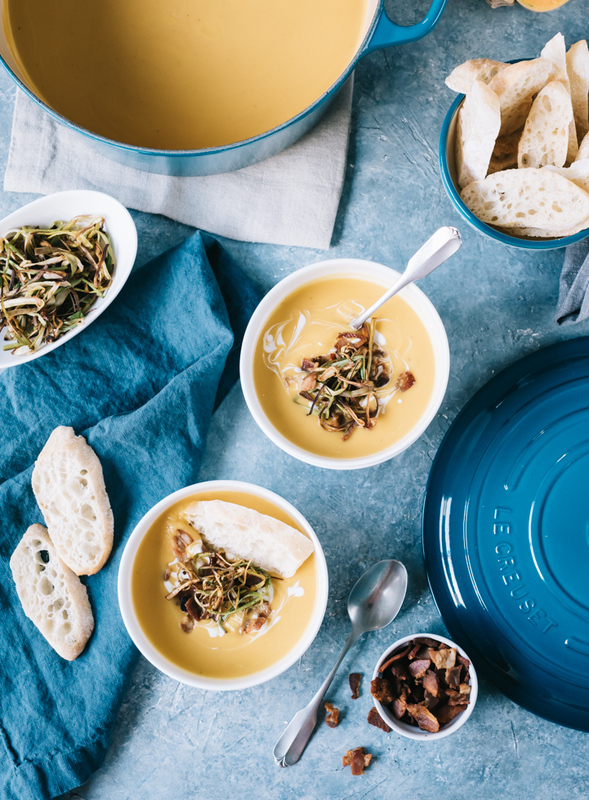 This roasted butternut squash soup is even better when prepared in a gorgeous new Le Creuset dutch oven in their new color, Teal, which is exclusive to Williams Sonoma and one of my most favorite colors. Gorgeous, isn’t it? I have had a 7 1/4 Qt Le Creuset round dutch oven for almost 15 years in a lovely green color called, “Kiwi“. It is well worn and loved, hundreds of recipes made it in from soups to braises to breads and more. The handle on the lid is cracked, the bottom is blackened from time spent over a gas flame. But it is still going strong. These pots last forever. My kiwi pot might not be as beautiful as it once was, but it is well loved and will always have a spot in my home. And now I have a new pot to go with it. Both match my seaglass color themed kitchen. And I am so excited for double batches of everything I normally make in one pot. So shiny and new! I almost didn’t want to make a recipe in it just keep it pretty and have on my shelf as decor. But it is such an amazing pot there is no way I can’t put it to use. 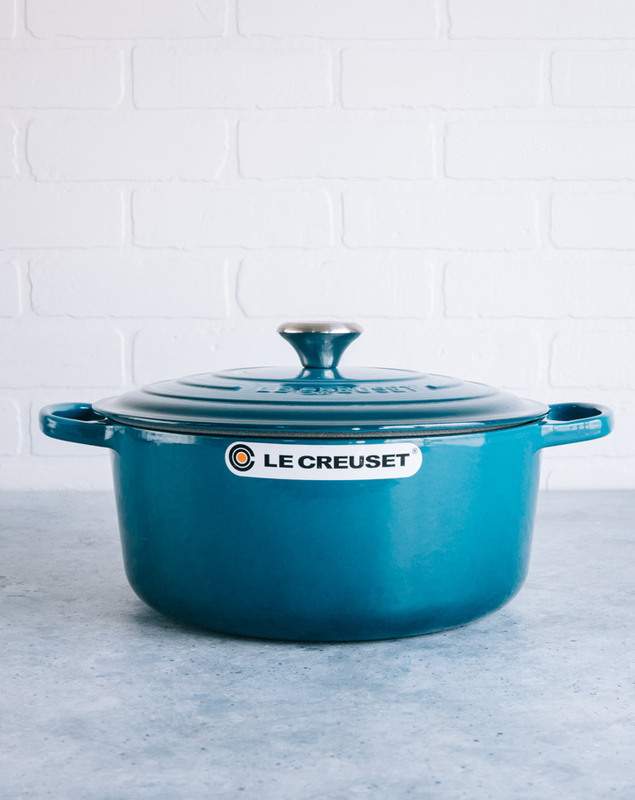 And one lucky reader will win one of these gorgeous teal dutch ovens for themselves too! Giveaway is at the end of the post. Let’s get back to the recipe first. I have several squash soups already on my blog but that doesn’t stop me from making more. I adore squash soups at all times of the year. 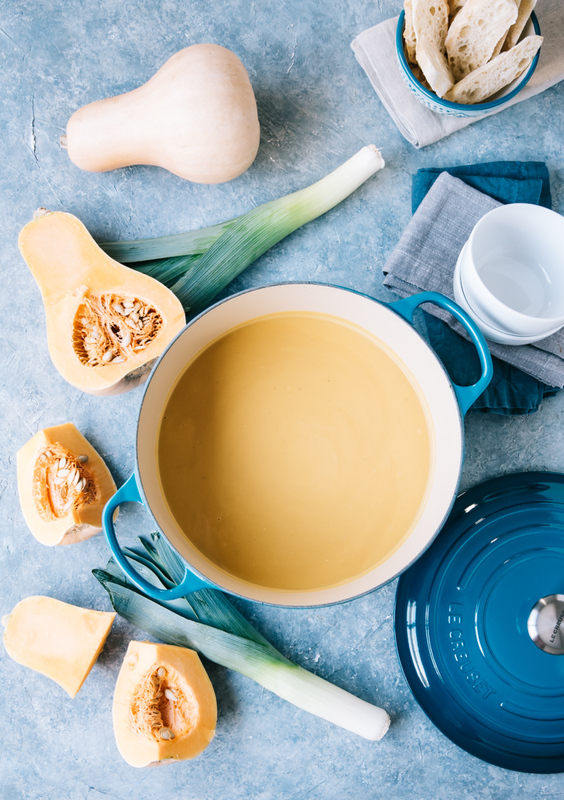 This roasted butternut squash soup recipe actually started from a pan roasted squash dish my husband made one night for dinner as a side to amazing pork chops he grilled. It was one of those clear out the fridge recipes. We happened to have a butternut squash we needed to use soon along with some leeks. We had bought leeks to go with homemade chicken stock, and bacon we always have on hand. My husband took that butternut squash, peeled, removed seeds and cubedit, added it to chopped bacon and thin strips of leeks and spread it all out on a baking sheet. The squash cooked and leeks crisped up in the fat that the bacon released as it cooked. 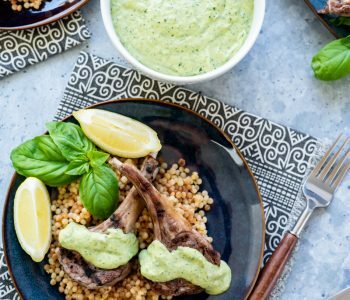 Simple recipe yet so good. I told him how these ingredients would be great as soup too. Roast the squash in bacon fat in the oven to slightly caramelize it and add a nice smoky flavor to the squash. To keep the soup relatively simple I start with yellow onion, leek and garlic cooked in bacon fat to keep the flavor simple and yet still smoky. I always add in a little white wine and then the roasted squash is added in. Chicken or vegetable stock is then added, the soup is simmered then pureed. 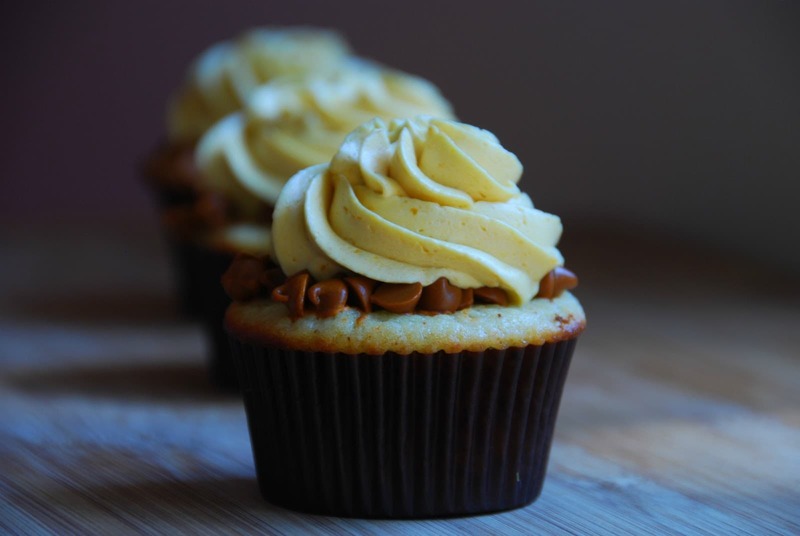 No creams or dairy is added other than a swirl of yogurt on the top and that is optional if you want to keep it dairy free. It is a fairly thick soup, you can always add more stock if a thinner soup is desired. 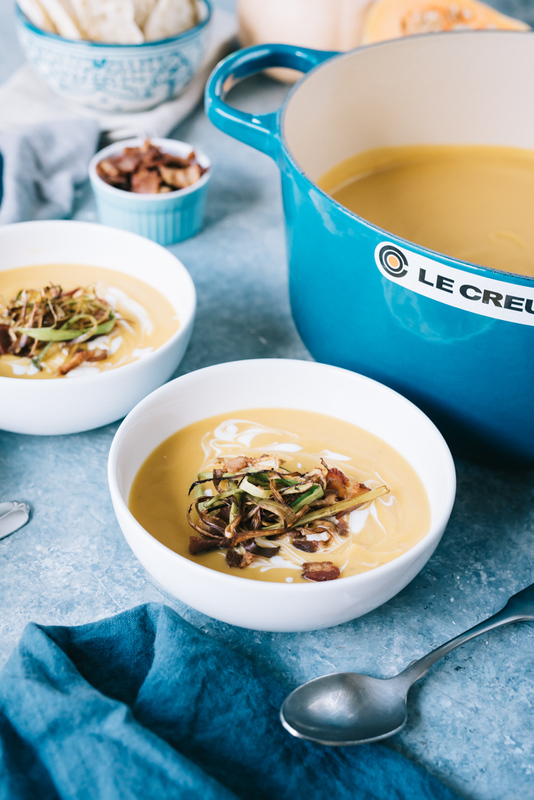 If you would like a butternut squash soup that is a bit richer with dairy you can try my Ritz Carlton Creamy Butternut Squash Soup recipe. Simple recipe for a complex tasting soup. 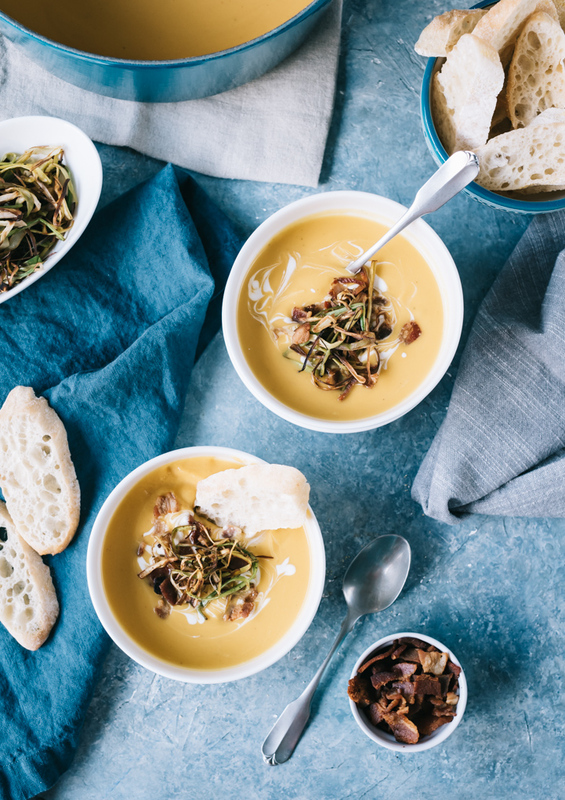 I love roasted butternut squash soup and I hope you all love this version as much as I do. Preheat oven to 400 Deg. Spread butternut squash chunks on a baking sheet and sprinkle with 2 tbsp of bacon fat. Season with salt and pepper. Roast for 30 minutes, stirring and flipping chunks every 10 min, until starting to turn golden. Prepare the leeks. 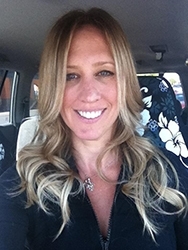 Trim off ends and any tough outer leaves. Trim off dark green tops so only white and light green remain. Cut in half lengthwise and rinse well. Cut one into 4 lengthwise sections then into smaller quarter moon pieces, set aside. Cut the other in half widthwise then trim into thin strips - about 3-4 inches in length set aside. While the squash is roasting, cook the onion and diced leek in the dutch oven in the remaining bacon fat. If there isn't much fat left, add a tablespoon of oil or butter. Once the onion and leek are soft and translucent, about 3-4 min of cooking, add the garlic and stir for one minute. Add in the white wine and stir then add the roasted squash. and season with salt and pepper. Remove to a paper towel to drain slightly. cooked bacon and crispy leeks. Serve with crusty bread. Turkey Andouille Gumbo! Yum Yum! I love chicken tortilla soup! This soup looks so yummy! That color of the dutch oven is absolutely gorgeous! Oh I’d plan on making a tomato soup in this pot, of course!! I love a good chowder. Corn, Clam, Lobster, they are all great to me. My current favorite soup is roasted cauliflower soup. So good with some crusty bread! I’m a basic girl. I love me some homemade chicken noodle. Always looking for new soup recipes to try! This one looks amazing! This sounds fantastic. It has been unreasonably cold lately and soup has been on the menu often. Tonight we had ham, potato and kale soup. 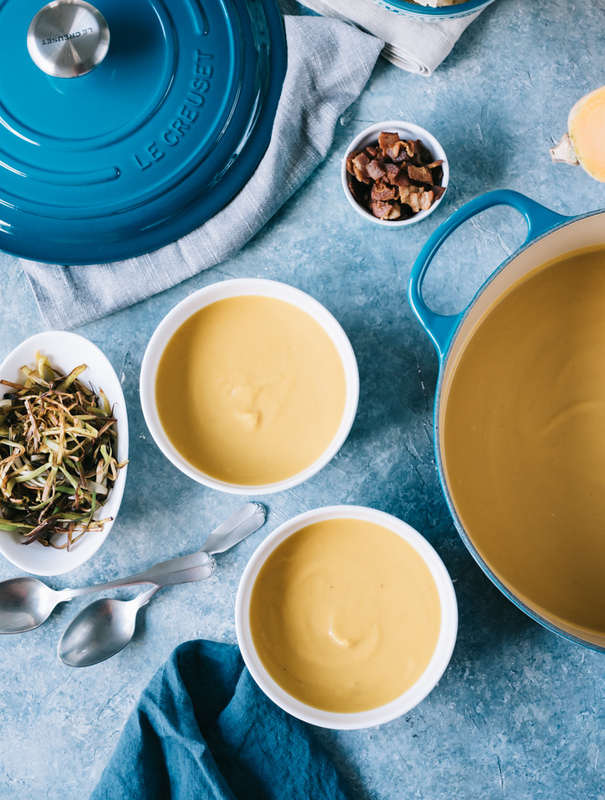 This butternut squash soup would definitely be a hit and nothing beats a LeCreuset pan to cook it in! 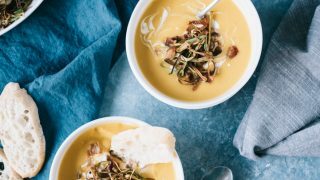 I love a good potato soup, but this butternut squash soup sounds like it would be right up there. Mushroom soup is my favorite. 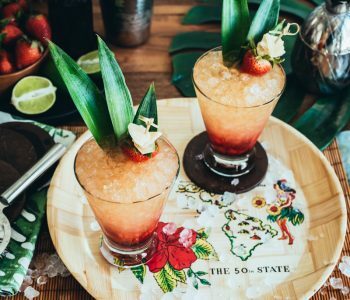 But this looks fantastic and I will have to try it. This pot is GORGEOUS! I wish I had this soup for dinner tonight. I’m so hungry and soooooo don’t want to cook. Love those crispy leeks on top! I love roasted jalapeño with cream soup! I’m from New England, so lobster bisque is by far my favorite! 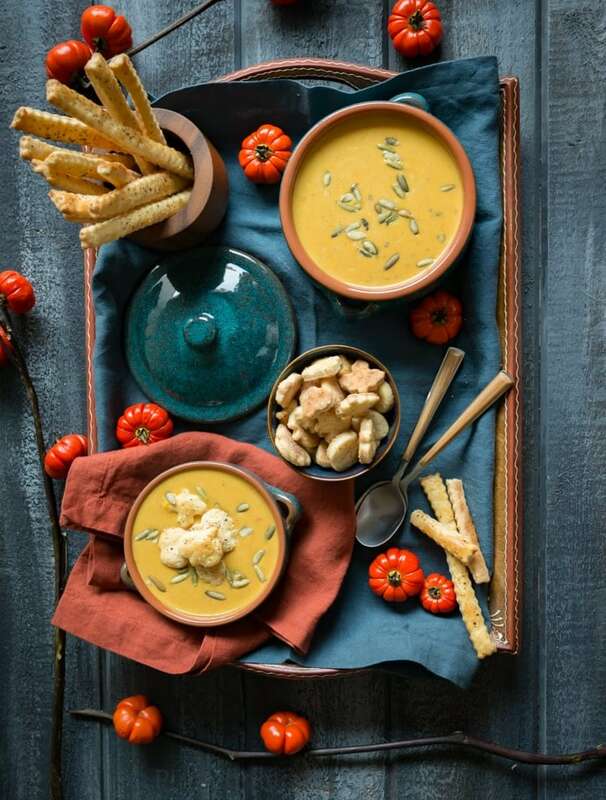 My favorite is butternut squash soup – can’t wait to try this! My favorite soup is navy bean and ham. For some reason I only make it when I have a holiday ham bone, need to make it more often. My favorite soup is broccoli cheddar. Lobster bisque is my favorite. That pot is my favorite color!! I love all soup, but a good french onion is hard to beat! Lentil soup. I like butternut squash too! All soupnis my favorite! I’m obsessed! I could eat soup every night. Especially homemade chicken pho! Yum! Oh, that is a hard one because I am a soup lover. I would say right now my favorite is lobster bisque. Looks gorgeous!! I’m all in for some roasted tomato soup. Avocado Chicken Corn Chowder…I got the recipe here! I really love loaded baked potato soup. I haven’t had a good one in years due to being lactose intolerant, but with all of these new lactose-free cheeses and milks, I’m going to have to give it try again. My favorite soup is chicken noodle soup! Would love to make it in this pot! French onion soup is my favorite! My favorite soup is Ukrainian Green Borsch. It is the best! Thanks for the chance in the giveaway. That blue is an amazing color! Creamy wild rice and pheasant! My favorite soup is Lemon Chicken Rice! I love so many soups, but chicken pot pie is one of my favorites! French onion is always a winner in my books! I think my favorite soup would have to be a Thai Tom Yum soup. But I also love a good parole, tortilla soup, and hot & sour soup too. I love all the soups!! Halibut & Shrimp chowder ( 1973 recipe ) was my first attempt pleasing my in-laws with Honey-Mustard oatmeal homemade bread . It’s a toss-up between Butternut Squash, Roasted Red Pepper & Tomato, and Miso. I love all three. Cream of tomato with thyme….. 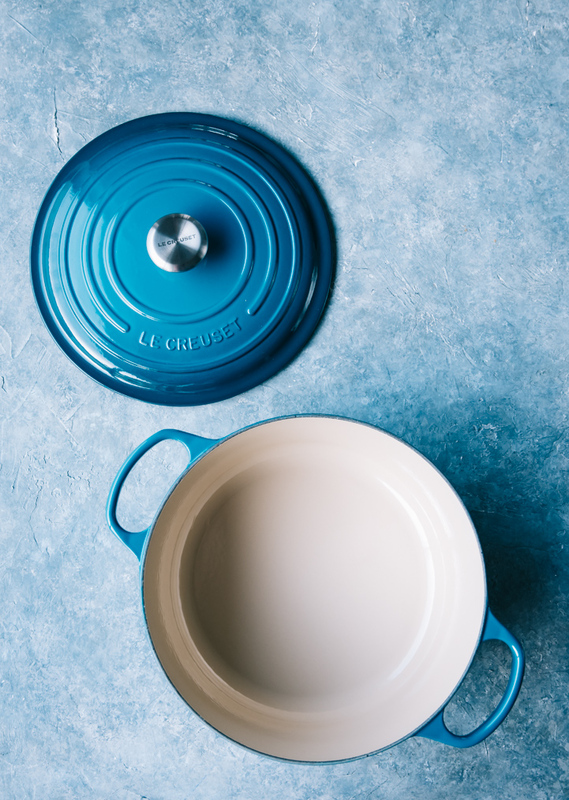 I love Le Creuset and would love to own one of these!! My favorite soup is White Chicken Chili…I make it all the time in the winter and it’s so wonderfully spicy and comforting during those cooler months. Cream of broccoli with cheddar cheese is always popular at my house – topped with homemade ranch croutons. Seriously, I love all soup! I love all soups and this one looks especially delicious. I can’t wait to make it. My favorite soup is chicken pot pie soup! My favorite to eat is probably Won Ton Soup, but my favorite to make is Chicken Noodle Soup. I love my mom’s sausage potato soup! Yum that looks so good! My favorite soup is a hearty Corn Ham Chowder my mom makes. Mmmm! Favorite of all time, Grama’s chicken soup! My favorite soup is chicken noodle soup. I love butternut squash apple soup, especially in the Fall when we’ve picked the apples ourselves. My favorite soup is Ribollita, except I make it vegetarian. My favorite soup is chicken noodle. Potato soup is my favorite. I love chicken corn chowder. I love lentil and chicken tortilla! I’ve always been a fan of Wedding Soup, love the combination of meatballs, chicken and spinach! Buffalo chicken soup is my absolute favorite soup! This soup looks fantastic and with bacon… my fav! My favorite soups are often potato based, clam chowder, zuppa toscani, loaded baked potato. I’d make them all in that gorgeous pot you’re giving away if I win and your soup too!!! My Dad’s homemade chicken noodle soup that he still makes once a week! My Mom is a great cook, but she thinks he makes the best soup and stays right out of the kitchen. I love cream of turkey soup. Cheddar broccoli soup is my favorite. My favorite soup depends on the weather. When cold outside, I love a good thick egg drop soup. In warmer weather, a good clam or corn chowder is unbeatable. Probably the corn chowder that I make in my slow cooker that has potatoes & Kielbasa in. 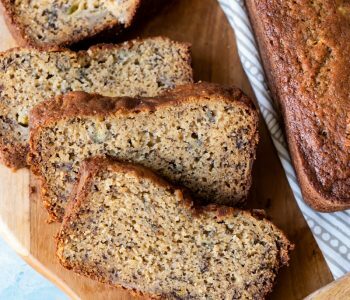 Super easy to make and so comforting and filling. I love chicken detox soup with turmeric and ginger! Hm… favorite soup… gonna have to go with broccoli cheddar! There’s nothing like a good potato soup, with cheese, bacon, and leeks! Homemade chicken and wild rice soup is my favorite! I love vegetable soup with cheese and crackers in it. Cheese and Broccoli soup is my favorite. I love my home made chicken noodle soup! My favorite soup is vegetarian vegetable. My favorite is a thick veggie soup! My favorite soup is my mom’s chicken noodle soup!! I love Tom Kha Gai! This soup sounded so good, I had to make it. It tastes as good as it sounds. Fairly easy to make too. Very, very yummy. The bacon and the fried leeks on top are a great touch. 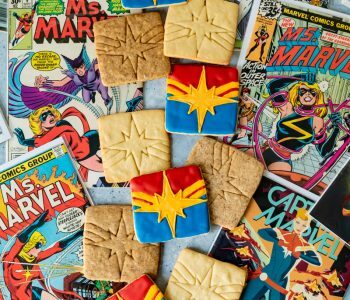 Self taught baker, home cook and blogger. 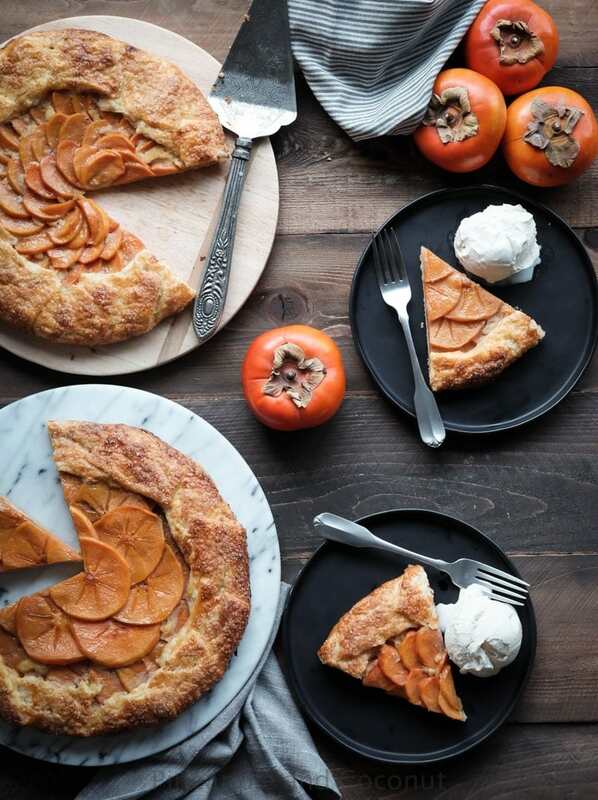 Freelance food stylist and photographer, commercial food stylist/photographer.